In the summer of 2015, undergraduate and graduate students interested in urban planning, design, and architecture participated in a five-week, design-intensive program at UC Berkeley’s College of Environment Design. The program, Design and Innovation for Sustainable Cities (Disc*), aimed to engage students in iterative, design-based solutions in order to reclaim public space for people, and included an underlying emphasis on tactical urbanism. 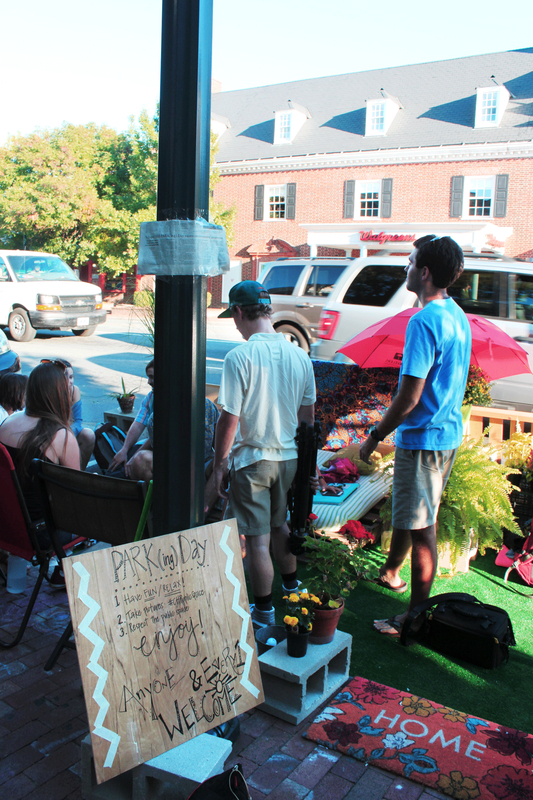 Pursuant to the program’s mission, DISC* alumni, Brian Vaughn and I, along with other UNC urban planning minors, decided to introduce the idea of PARK(ing) Day to Chapel Hill. One of the Disc* professors, Ghigo DiTomasso, who is also a project manager at Gehl Architects, introduced Disc* students to PARK(ing) Day. The event originated in San Francisco in 2005 when urban designer John Bela of Rebar Art & Design Studio decided to feed a meter and essentially lease a parking space and transform it into a park for one day. 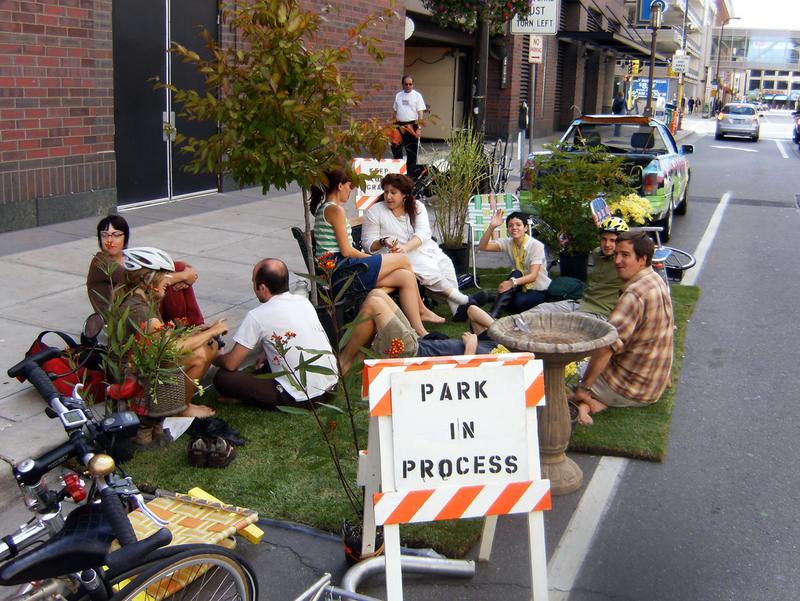 Since its inception ten years ago, PARK(ing) Day has been adopted around the world and now takes place annually in over 35 countries and 162 cities. 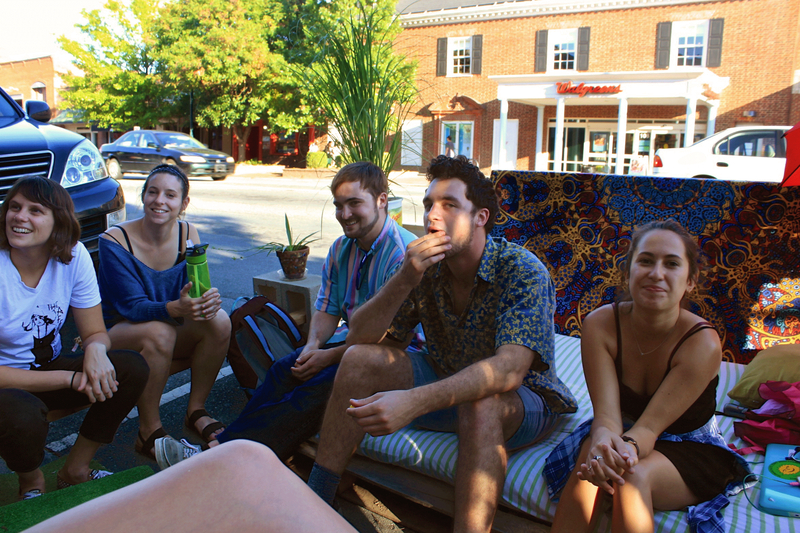 On September 18, 2015, Chapel Hill became involved in this event for the first time by providing a temporary public gathering place in a single parking spot on busy Franklin Street. Public gathering places are appealing if they allow for dynamic movement and meet the specific needs of the users. For example, consider the steps outside of Chapel Hill’s local frozen yogurt shop. This area is regularly bustling with groups of people enjoying the public space and their frozen yogurt. It is an attractive space for people to linger and socialize. With this approach in mind, my personal goal for Chapel Hill’s PARK(ing) Day was to encourage dialogue in the community about supporting more spaces of this nature. We used the 8’ by 22’ parking space as a means to transform Franklin Street into a sticky place. Stickiness, used here, is a design term. It refers not to the mugginess felt after walking a few minutes in southern humidity, but rather the experience of your favorite park bench, or café nook, that causes you to feel safe, welcomed, and connected with your surroundings. The parking-spot-park was fashioned out of wood pallets and cinderblocks and decorated with various types of seating, Astroturf, and potted plants. It generated a constant flow of activity, and encouraged a diverse mix of strangers to engage with one another in a collective space. During the eight-hour event, community members of all ages used the park for lounging, eating, drawing with chalk, and even playing mini-golf together. 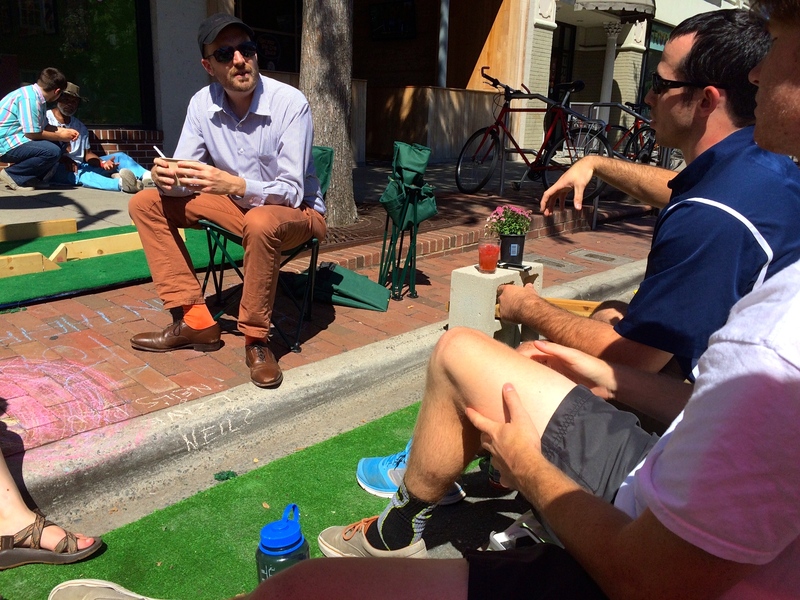 Chapel Hill’s PARK(ing) Day proved that public spaces that are designed for human interaction can be effective platforms for community involvement , and have the potential to have a significant impact on our towns and cities. About the Author: Alexi Wordell is a senior undergraduate at the University of North Carolina Chapel Hill, by way of Northern California. She majors in American Studies with a concentration in Folklore, and minors in City and Regional Planning and Geography. Over the summer of 2015, Alexi studied urban design at UC Berkeley where she focused on innovative public seating design. She is currently an intern with the Town of Carrboro, NC.